(Corpus Christi, TX April 25, 2016) – American Bank Center staff came together to honor and recognize a local WWE fan for his hard work and determination. Last year, Aaron Ruiz along with children with the Pilot for a Day Program attended a very special meet and greet with WWE Superstars Sin Cara and Kalisto for the WWE Smackdown show. Their message to “Keep fighting and keep moving forward” meant something very special to Aaron. Recently, Aaron’s mother reached out to the American Bank Center staff asking for a letter of recognition from his visit. His mother explained the reason for this letter was because a Board of Review convened to consider the application of Aaron Ruiz who is currently a Boy Scout and unanimously voted to recommend him for the rank of Eagle Scout. Because of his new ranking, Aaron and his mother were reaching out to local businesses and organizations that he has visited for his honor table. 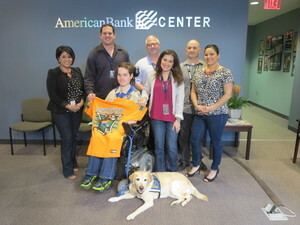 American Bank Center was so moved by their request, a letter of encouragement was written by the General Manager, Jim Salamenta, and staff all gathered not only to give him his letter from American Bank Center, but Aaron was also surprised with official WWE gear and a certificate to the next WWE event for him and his family to attend. SMG managed American Bank Center is Corpus Christi’s premier event center. Follow us online at www.Americanbankcenter.com, facebook.com/AmericanBankCenter, twitter.com/AmericanBankCtr, on Instagram @americanbankcenter, Tumblr @AmericanBankCenter, and now on Periscope @Americanbankcenter.